LAWRENCE — With oars at the ready and a new design, the University of Kansas School of Engineering concrete canoe team will hit the waters of Lone Star Lake near Lawrence this week looking to repeat as American Society of Civil Engineers (ASCE) Mid-Content Regional Conference Champions. KU plays host this year to the three-day conference for the first time since 2007. More than 400 participants from 15 universities are expected on campus for a variety of competitions, presentations and social events today through Saturday, April 23-25. KU’s concrete canoe team took first place in the 2014 Mid-Continent Regional competition and advanced to nationals, where members earned the Spirit of the Competition Award. Concrete canoe team co-captain Billy Hirchert, a senior in civil engineering, said last year’s success, plus performing in front of a home crowd this year, have raised the expectations for the team this spring. In hopes of improving their boat’s speed and handling, the team has revamped its canoe, constructing a lighter and more streamlined hull. This required the team to step outside the normal boundaries of design. 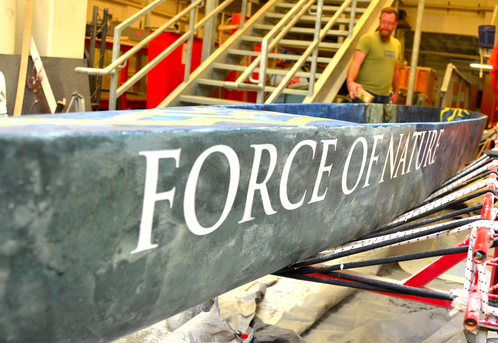 The concrete canoe competition, as well as concrete bowling and the geowall contest, will take place from 8 a.m. to 4 p.m. Saturday, April 25, at Lone Star Lake, 10 miles southwest of Lawrence. There’s also a steel bridge competition planned Friday at the Lied Center. See the full ASCE Mid-Continent Regional Conference schedule.